While the world including this writer admires the determination, discipline and control of the Japanese population during the terrible 2011 triple tragedies, one needs to view this in a more complete perspective. The triple tragedies of 2011 included a massive earthquake, a gigantic tsunami and one of the worst nuclear mishaps in history. Writers wrote about, TVs showed and the world praised the Japanese for their control and discipline. Hungry stomachs waited patiently in queues for their turn to get prepacked food handouts. Long winding queues patiently waiting to buy a few bottles of water from a near empty convenience store... the examples and exposure went on and on. Easyrambler has this uneasy feeling about the calmness and patience of the Japanese population. The Japanese government has in more cases than one, taken advantage of this 'peaceful' population and done things that went directly against the interest and safety of the Japanese people. The content of this article might make some readers uneasy, you might vehemently disagree with the ideas and thoughts expressed here - but let your expressions be revealed AFTER having read the COMPLETE article. The path to the development of Japan's nuclear resources has not been smooth even before the terrible disaster triggered by the 2011 earthquake. 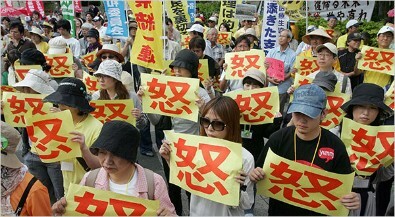 Public demonstrations were held, Japanese scientists warned about the dangers that an earthquake or tsunami could bring. Keeping track of the present tragedy you can see that much of this dissent was ignored by the government. The people who warned about the danger relented, they did not get louder in their protests. The experts wrote a few scientific excerpts on the topic, probably spoke before a microphone at a seminar and everything went quiet. The Government did what it wanted to do, basically by ignoring the voice of the people. Had the voices warning of danger increased in volume or number, it probably would be a different story. International experts would become aware of these objections and analyze the possibility of a danger. The effects of a nuclear tragedy beyond the geographical boundries of Japan would be discussed and debated... and the Japanese government would hopefully have a change of nuclear plans and policy. That did not happen, what did happen is for the world to see today. There is nothing wrong with a peaceful protest, there is no need for violence and obscenity in any form of public protest but, there is a need for a protest for a valid reason to be long, unrelenting to get local and international attention. A typical Japanese public protest consists of a hundred or probably a few thousand people. Protestors are neat, disciplined and extremely well mannered. The time and duration of the protest is fixed. People gather at the appointed site, hold up well printed banners in one or more colors. If there is a microphone, the use of the device is orderly. No one shouts out of turn, no one tries to get media attention by hovering around international TV crew. Protestors wait patiently and take turns to talk to the protestors. The smartly dressed police rest on the sidelines. It is much like a Japanese 'protest office meeting'. As the time for ending the protest draws near, people glance at their wrist watches, politely thank each other and head for the local train. The local authorities and government officials, take off their ear plugs and go on with their work. So what is wrong with such a protest, nothing. It would be fine if the government heeds to the calls of the protestors demonstrating in this calm and peaceful way. It could hold an open public review of the reason for the protests - analuze the demands of the protestors and inform them of the final decision. But this apparently does not happen in Japan - the indications of this are now been seen by the world. The calm and disciplined attitude of the Japanese people can be seen in all situations. It generally helps develop a peaceful society, and is admirable. But the authorities have developed their own confident and calm way of going about their policies and projects without caring about the feelings of the general public. We had spoken to a Japanese accounting auditor with an interesting question. When a small cap (hat) that gets exported from Thailand at a cost of 60 baht (2 U.S$) sells for 300 baht (10 U.S$) on the Japanese streets or as high as 450 baht (15 U.S$) in a Japanese store - does the government not rake in a huge amount of tax on this mind boggling profit margins? This is very interesting since almost all products in Japan carry such profit margins. Even that educated and experienced accountant, could not explain how such transactions were handled in Japan. A strand of stone beads that is exported from Jaipur, India at around 1.5 U.S$ sells in Japan for around 10 to 12 U.S$! So where does all this government tax go? There has been little by way of infrastructure development in Japan over the past 5 years. The last thing that we heard was about a super fast 'bullet train', this was around 20 to 25 years ago during our college days. If you thought that this improved the life of the general public - you might want to know that, the train fare for this transport is something that very few middle class Japanese can afford. The discipline of the Japanese people is well known, decades ago hundreds of thousands of Japanese worked without wages to rebuild a destroyed Japan during the World War. The results are amazing, the country grew back from the ashes to become a world power at least in economic terms. We read this in the history books, it was a terrific feat. There is a part of the Japanese population that has remained more or less forgotten. Walk around the city markets after the shops close for the night. You will see these Japanese people walking around with collapsed cardboard boxes, very large boxes. They are looking for a spot to place the box and open it up - they spend the night in that box. These people ofcourse do not protest, they probably do not qualify for that 'disciplined' Japanese style that has now become famous. Remember Okinawa? It is an island in Japan, a place where the Americans have set up military bases. So what are the Americans doing with the military in Japan? Nothing to do with Japan, they just want to use it as a short notice launch pad when they feel like spreading their version of democracy somewhere on the globe. The Japanese people do not like the American forces in Okinawa, they do not want them in the country. So why do the Japanese feel that way? Well there were some serious cases where the American soldiers molested or raped innocent Japanese girls. So how did the Japanese make their anger at the American presence known? Well they had one of those tame, disciplined protests. And what effect did this tame and peaceful protest have on the Japenese Government? None whatsoever, the government reacted in an equally calm, composed and confident style - they allowed the Americans to continue to remain in Japan. All they did was to move them to another part of the same island! The Americans used their power and bullied the Japanese into accepting their terms. Here is how the New York Times expressed the American triumph. ...The announcement, a victory for the Obama administration and a humiliating setback for Mr. Hatoyama, confirmed what the Japanese media had been reporting for weeks: that he would accept Washington’s demands to honor a 2006 agreement... Full Report. Coming back to the recent natural disaster, while the worlds TV channels were spinning clips of empty shelfs in convenient stores, and showing city elite waiting in queue for bottles of water - little did the world know that there were Japanese dying on islands from the quake and tsunami - these islands would be visited by rescue teams only several days after the tragedy. They formed those HUGE 'missing' numbers reported by Japanese TV stations. Needless to say that most of those numbers moved to the 'dead' list. The purpose of writing this ramble is to draw attention to the rather casual and uncaring approach of the Japanese authorities to the rather peaceful and calm way in which the Japanese people express their feelings. It is unlikely that the people will change their ways, it is equally unlikely that the government will take any heed to the feelings and fears of the population. If you feel like blowing your top after reading this ramble, send us your comments at easyrambler@rocketmail.com It will not make us change our point of view, but it might just help you in letting of some steam!